Francis Gilbert’s last book – “I’m a Teacher, Get Me Out of Here” – was described by Clare Short in the “New Statesman” as ‘a funny, moving and worrying memoir’. 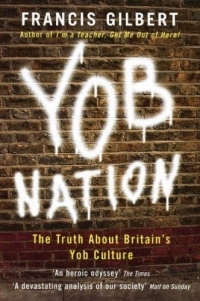 His new book is also funny, but far more alarming; it shows how the relentless march of yobbery has infected every aspect of our lives; violent crime has quadrupled since 1979, and foul language and abusive behaviour has permeated the whole of society. It’s not just football hooligans (and footballers) who’ve gloried in yobbish behaviour; politicians like Alistair Campbell and John Prescott have played their part. With the old moral codes no longer existing, society has become engulfed with fear and distrust. Francis Gilbert draws on his own experiences (working in a tough inner-city comprehensive), and of people all round Britain, to vividly illustrate his thesis. This rewarding book by Francis Gilbert demolishes complacency by showing the real misery caused by lawlessness.